Figure 1. The third tier registration of our proposed methodology: Symmetry-based fragment registration. Left: using the partial reassembly, we extract a symmetrical expansion of the object. Middle and right: Potential candidate poses for the disjoint parts (a),(b) and (c) are generated and filtered by the CH expert, to result in the final reassembly of the object. 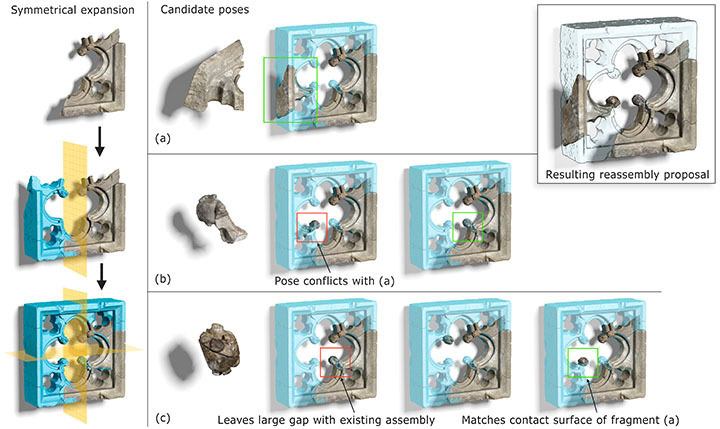 We present a novel and generic user-guided approach for the digital reconstruction of cultural heritage finds from fragments, which operates directly on generic 3D objects. Central to our approach is a three-tier geometric registration approach that addresses the reassembly problem using i) the contact surface of the fractured objects, ii) feature curves on the intact surfaces and iii) partial object symmetries. In contrast to most existing methodologies, our approach is more generic and addresses even the most difficult cases, where contact surface is unusable, small or absent.We evaluate our method using digitized fragments from the Nidaros Cathedral. We thank Ivan Sipiran for providing the symmetry detection tool of  and the authors of SparseICP and Super4PCS algorithms for the publicly available implementation of their research work. Finally we would like to thank Nidaros Cathedral for the data-set . This work was supported by EC FP7 STREP project PRESIOUS, grant no. 600533.